Vegetarians that is. Three weeks ago our family made the decision to embrace a plant based diet for health and well being. This journey into a herbivore lifestyle has been a great deal easier than I thought after 40 years of being an omnivore. We have made it through Christmas quite well with the only challenge being that I love love love to bake and since we decided also to give up sugar…I really missed that tradition. This is the first holiday without 1 single Christmas cookie with frosting and sprinkles. A few new fav meals has been wrap sandwiches with lots of spinach and veggies and avocado and a dill sauce. I made a quick and easy pasta with whole wheat linguini , garlic olive oil, tomatoes, onions , black eyed peas, and a little mushroom and capers on the side for my D.H. Kenny. Not adding dairy or meat really cut back on the fat and calories, but was so fresh tasting that I didn’t miss it at all. Kid #1 liked it….kid #2 not so much. The biggest treat so far has been this lovely meal prepared tonight by Kenny after stocking up on tons of great produce at Whole Foods. All the Peeps that know me well knows that Kenny put himself through college by cooking in a very upscale Italian restaurant…so he is a far better cook than I and I do so enjoy getting treated to 4 star meals in my own home. Until today…my favorite meal he used to make for me was chicken Marsala. Tonight my favorite meal changed into whole wheat pasta with an avocado pesto sauce. This is completely vegan and ooohhhhh sooooo delicious. Really indulging the happy tummy feeling with this meal. : ) Thanks Kenny!!!! I should note that I am not promoting everyone become vegan. This is a lifestyle choice that we have made for our health and well being and I understand that it’s not for everyone. Nor am I saying that if you are not a veggie eater that you are in no way any less healthy. Just sharing a little bit of our personal journey. I did sit down long enough with the peeps yesterday to relax a bit and get a sweet little Valentines card done. I love the layers here and the chipboard house and heart. The sentiment says it all. 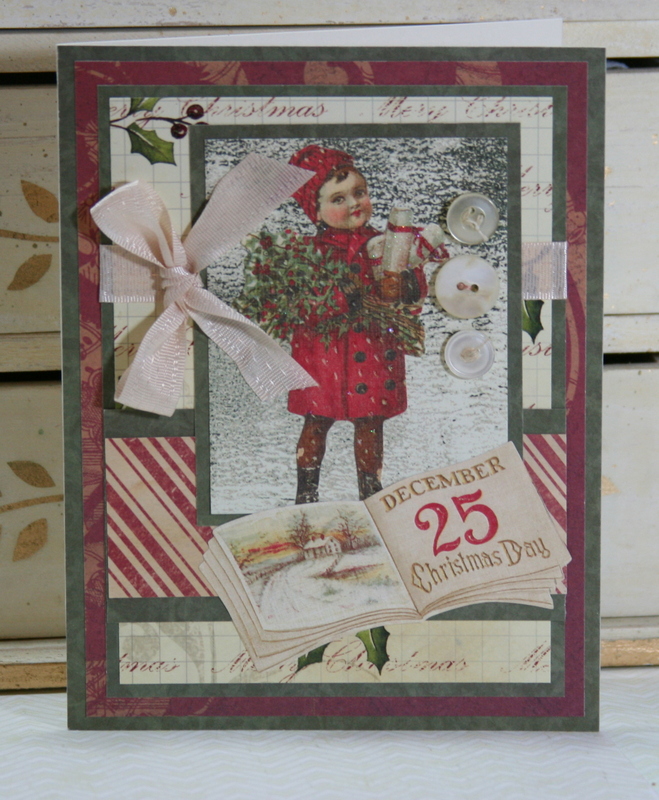 The paper here is from Pink Paislee as well as the die cuts. The house is covered with Jenni Bowlin typography. 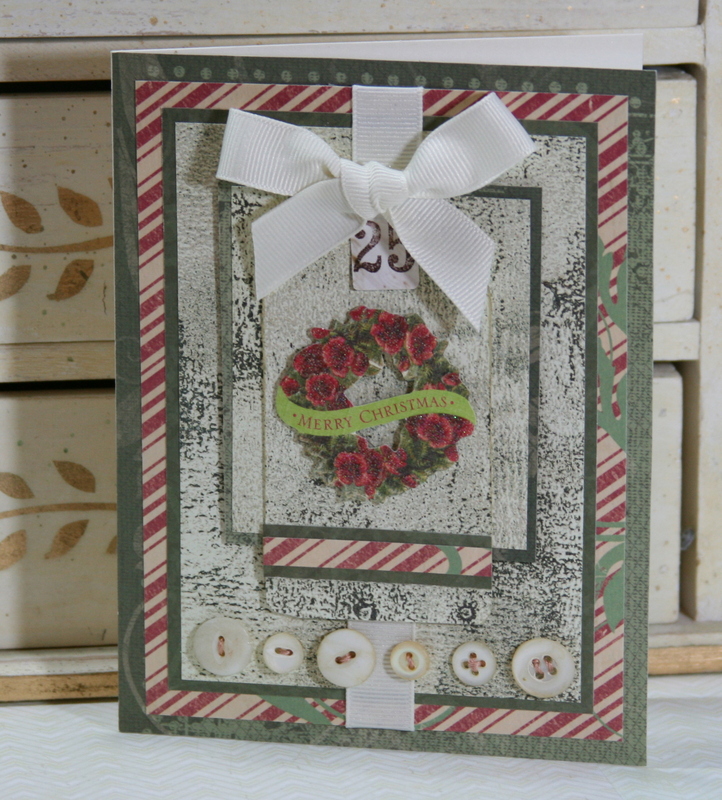 The little piece of bingo card came from my dear friend Carol : ) I added some real vintage buttons with twine and a nice wide ribbon with bow and glittery flower. We had 51 entries and once again I got out the beach bucket and filled it with strips marked for each of the comments. Congrats to the lucky winners! Please email me at vnemchak@hotmail.com with an address that I can ship your prize package to. After the huge relief of accomplishing 1 of my big projects that have to get done in the next 2 weeks…I decided to take a little break from work and deck the living room. 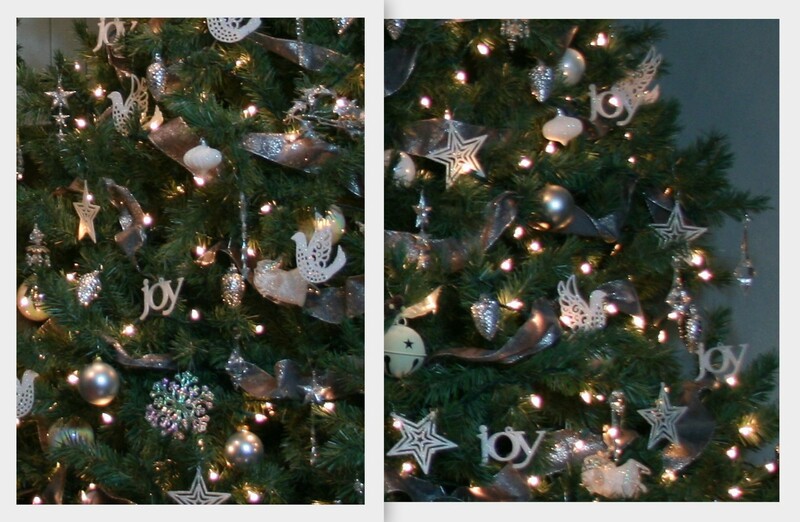 Here is the pic with a little photo effect…..
I’ll have to admit…this is not my usual volume of tree embellishing. I am finding though that less may actually be more. 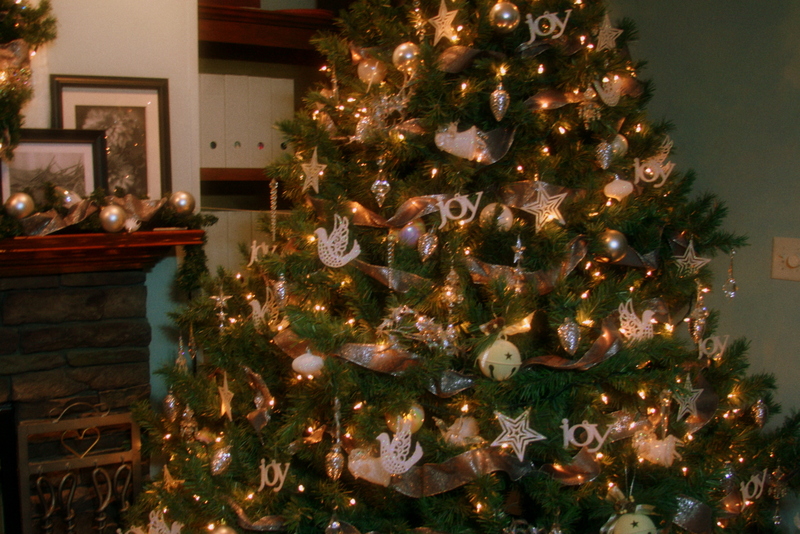 This tree used to hold hundreds of red and gold and white ornaments, poinsettia swags, ribbon….the list goes on and on. This year I fell in love with a beautiful spool of wide ribbon at Costco and was so inspired by it’s simplicity. I gathered only white and silver decorations….and much fewer than usual. I am quite pleased by how it turned out. Keep in mind this tree is 9 feet tall and Ginny is 5 feet 2 inches so there was a lot of climbing up and down the ladder yikes. If someone is with my dear Mother right now viewing this…could you please pick her up off the floor as I believe she just fell out of her chair in shock. You can’t see the small feisty grey kitten under the last row of limbs. I purposely left out the bottom row to make kitten removal easier on my back. This actually had the unintended bonus of showing off nicely the beautiful wrought iron tree stand that is normally hidden. This is where I started decorating. 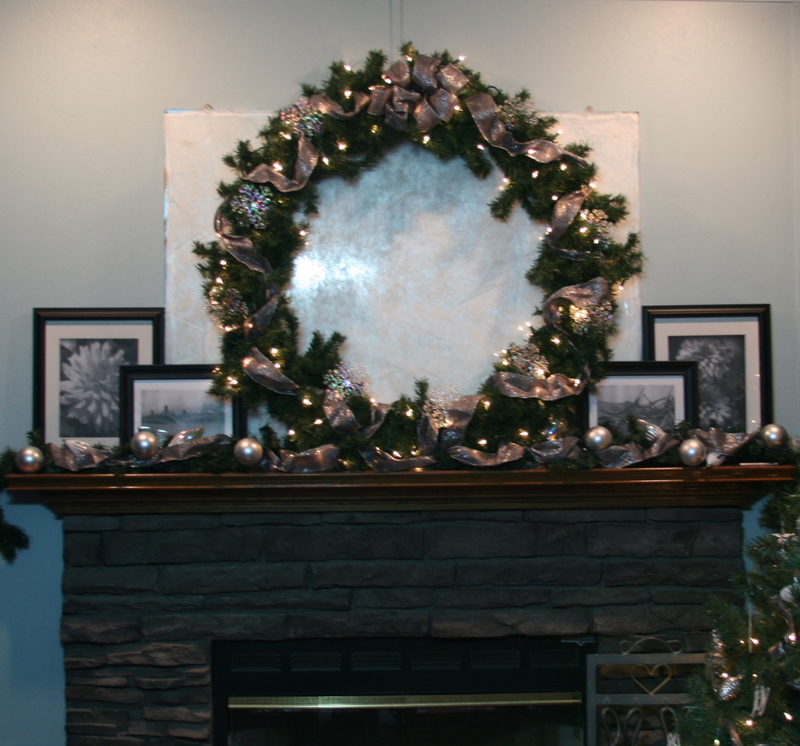 We acquired this gimoungus wreath many years ago, and at the time thought it was pretty snazzy with the lights already on it. WRONG!!! It didn’t take long for the lights to stop working and when I went to take them off to replace them found that each light bulb was attached with nearly unbreakable plastic clip. ugh. 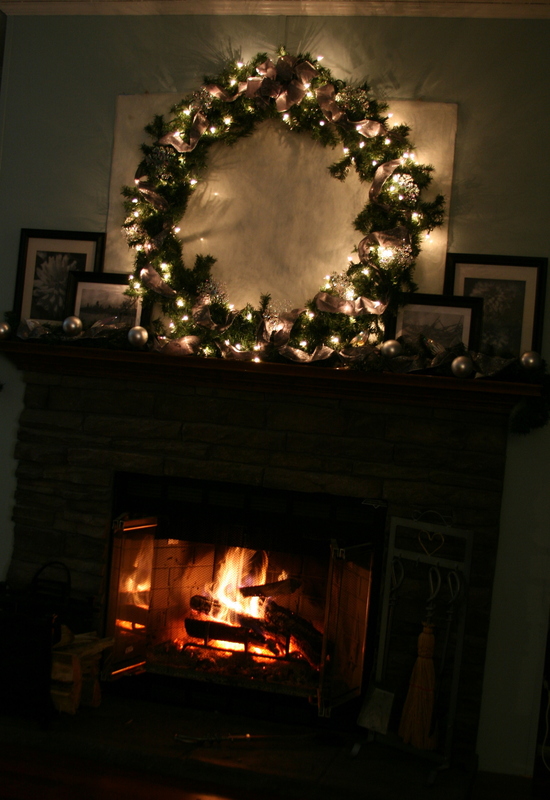 After an hour of swearing and removing all but a small portion of skin from my knuckles I had the lights off….but had lost the decorating mojo…so we just had a wreath for over a week. Here is a couple different close ups. I think it turned out very simple and shabby. Hope you all have a wonderful crafty day!!!! The high school orchestra is having a fundraiser and asked me to participate by altering a violin. Of course I have to say yes…first of all how can I say no to a dear friend??? 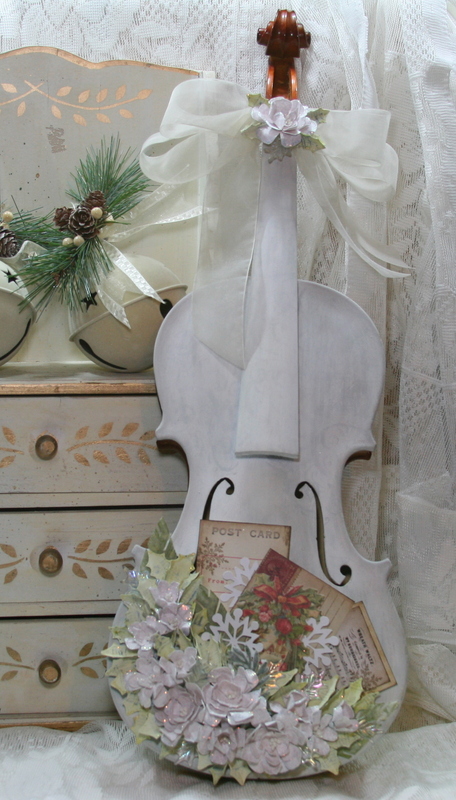 But really…how often do you ever get a chance to paint a violin???? 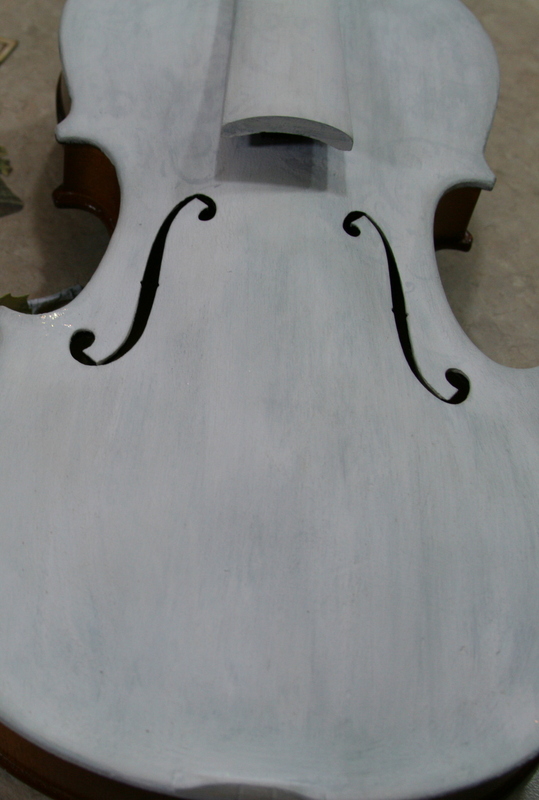 I should mention that the instruments that were altered were no longer usable and not ruined for the sake of art. Then I base coated it and aged it with distress ink. 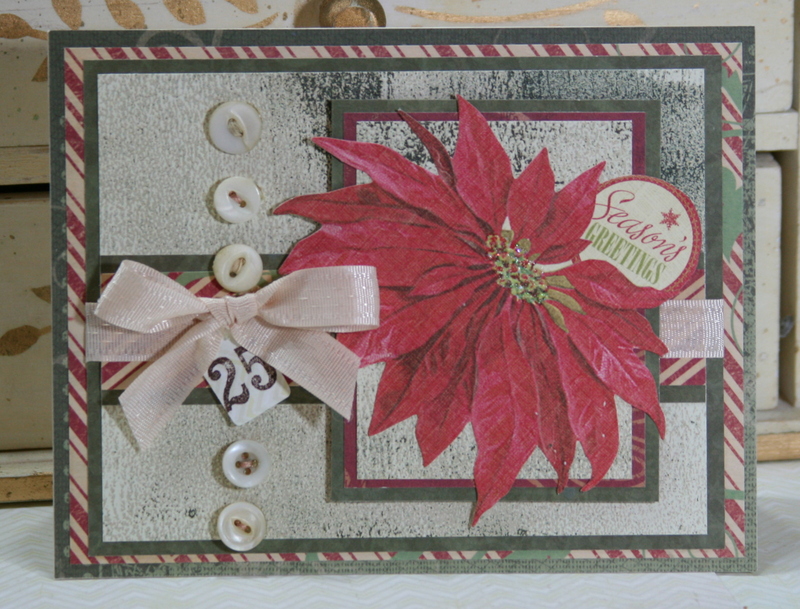 I gave it an over all stamped pattern then whitewashed it to blend. 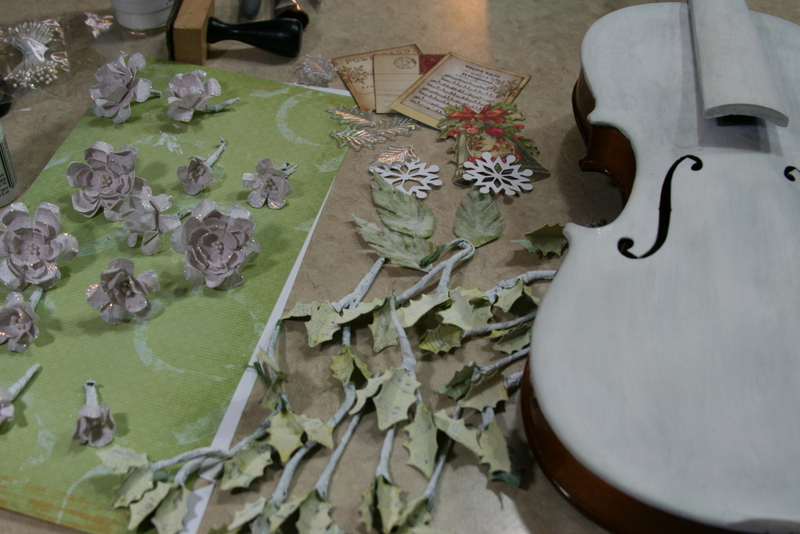 I wanted to make all the embellishments out of paper…and I mostly succeeded. There are just a few not paper additions. I used a favorite image of sheet music from Graphics Fairy and printed it on heavy cardstock. I ran it through the Cricut to give me lot’s of holly shaped leaves. 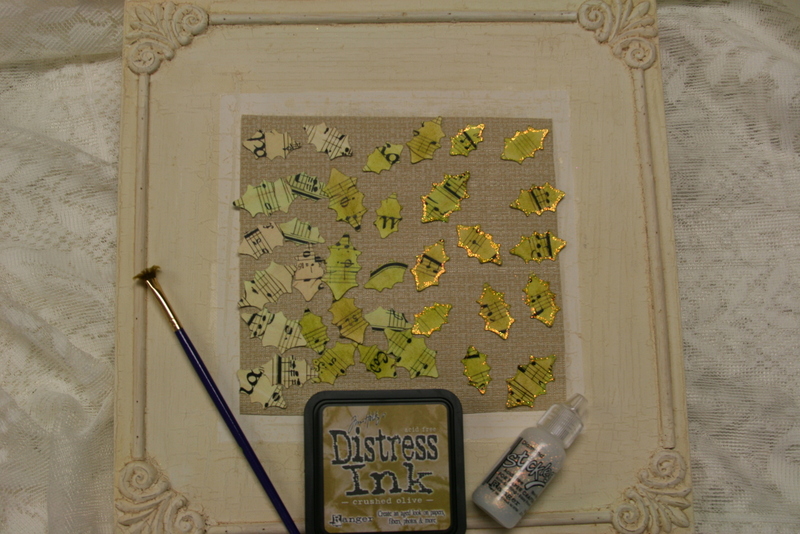 Next I inked them with Crushed Olive Distress ink. A little Stickles around the edges. Once this was done I whitewashed them and attached them to floral wire. I painted the stems after binding them to conceal any green that might show through. I used the Cricut to cut the flower shapes also. 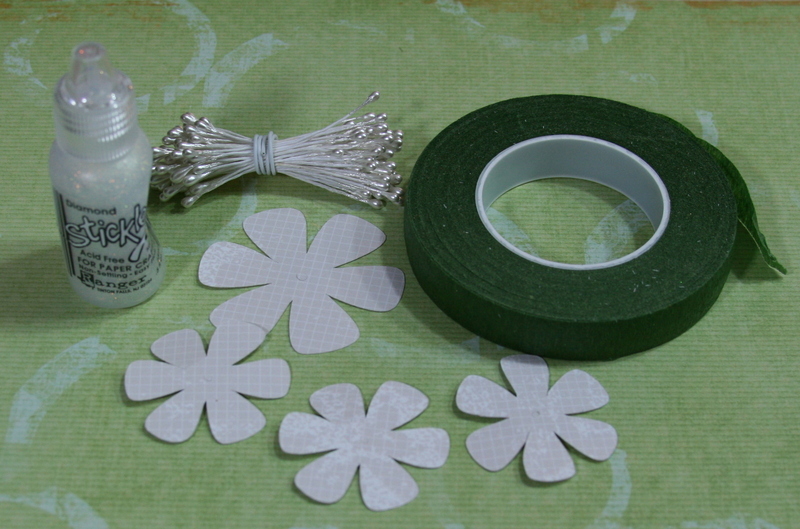 I gave them a pretty center and layered the winter white cut outs and attached them to a floral wire stem. Again I painted the stems to conceal. After a fair amount of scrunching I had the flowers shaped the way I wanted then gave them a nice edge detail with more of the Stickles. Here are all the parts assembled and ready to create the arrangement. 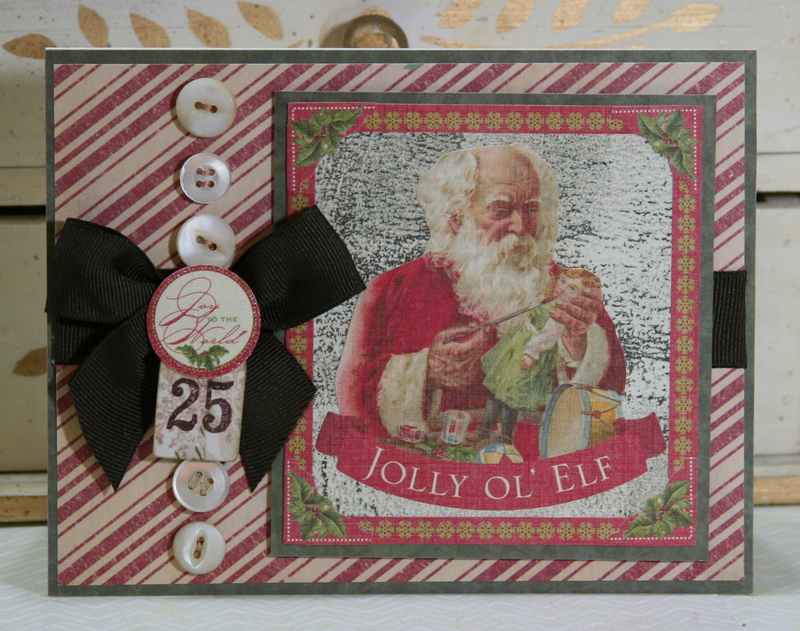 You’ll notice I added a few snowflakes, and vintage image embellishments. 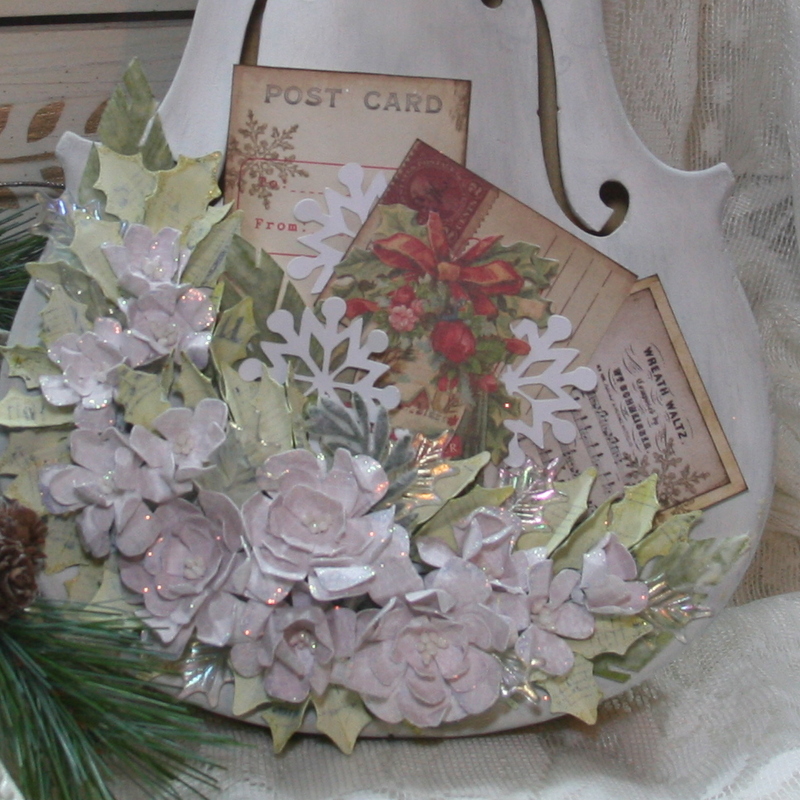 I thought it would be a fun addition to include sheet music with a Christmas song….so back to Graphics Fairy I go and found the “Wreath Waltz” Perfect for an orchestra fund raiser!!! 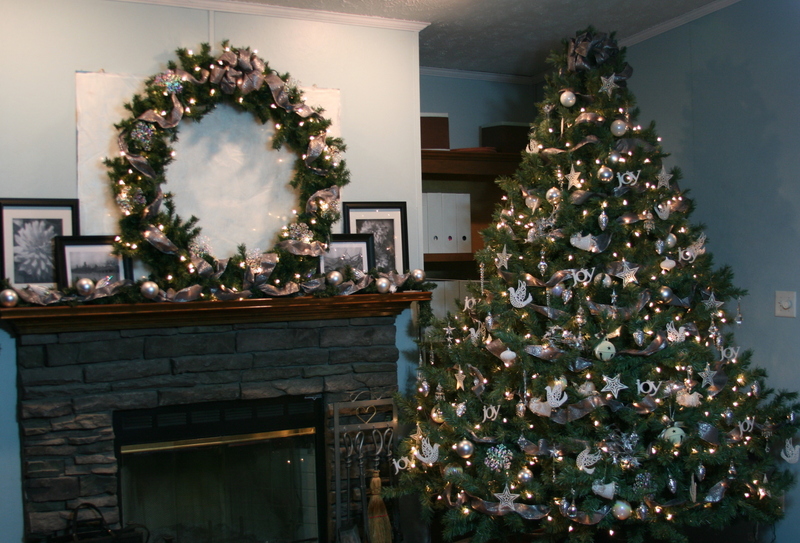 Hope you enjoyed the behind the scenes look at this holiday project. I’m wishing for a super successful fundraiser for the high school : ) I’m glad to be a part of it!!!! I had so much fun giving away a great prize last month that I decided to do it again! There are two prizes this time….so we can draw the names of two lucky winners. Want to get in on the chance to win??? Here are the simple rules…. 3. Let’s make it a fair game….please only one entry per IP address….so no voting for pets, long passed relatives or imaginary friends. 4. You can enter until 11:59 on the 11th of December. 5. We will draw a name at random on the 12th of December. Winner will be announced in a special post after 12 pm on the 12th. 7. Good luck to all who enter!!!! 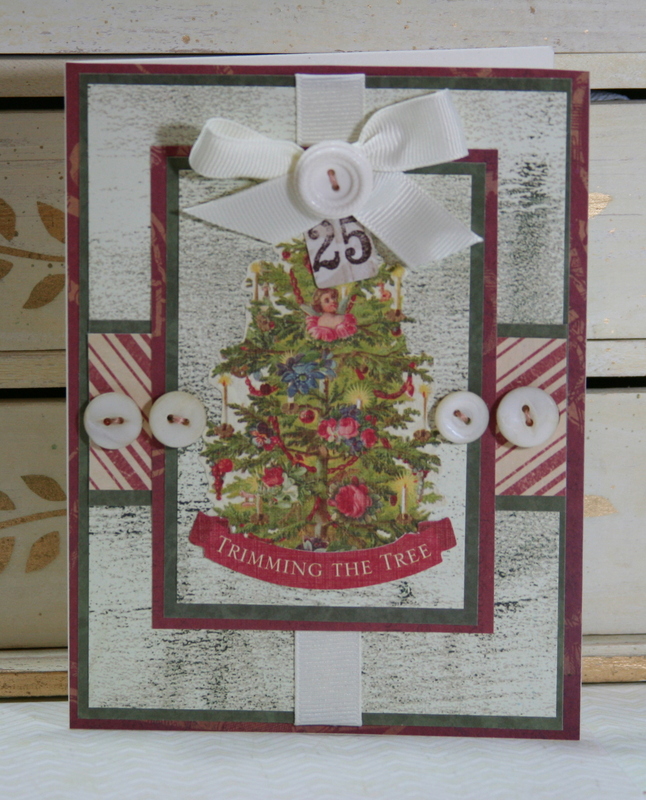 I made a selection of pretty little Christmas cards yesterday in honor of our first real snow. The images I worked with came from my dear friend Jane. 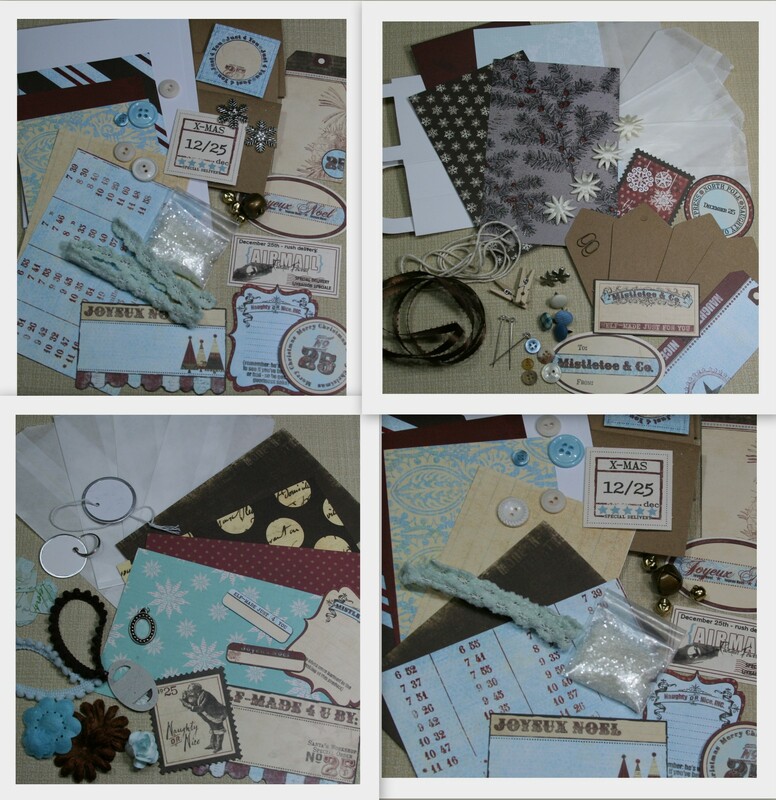 Thank you for sharing and coming to play paper : ) The papers I used all came from the stash….so I was happy to get through a little of what I had on hand and not get into new stuff. I added lot’s of buttons and ribbon and way too many layers of paper lol. I think they turned out very vintagy!